A washing machine is an essential appliance in every home. 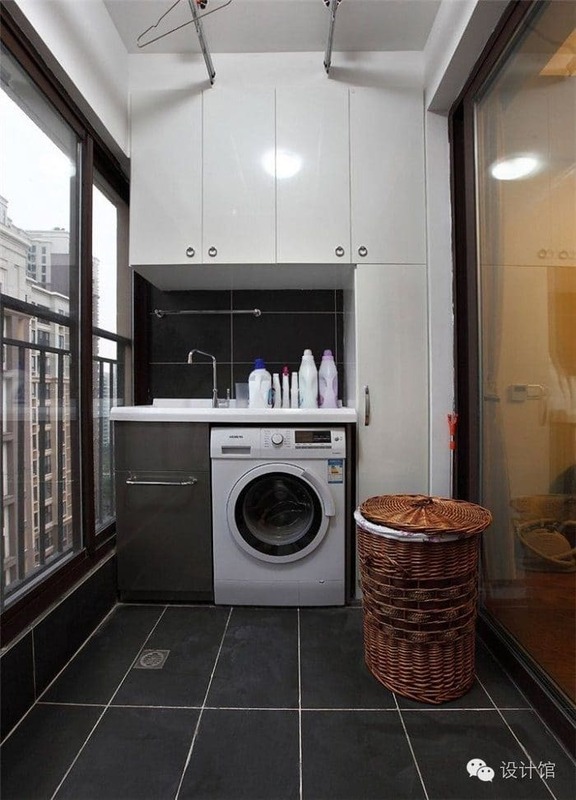 But if you have a small space, it’s not easy to organise the laundry space. Most homes in Malaysia, whether landed or not, will come with a backyard area behind the kitchen. 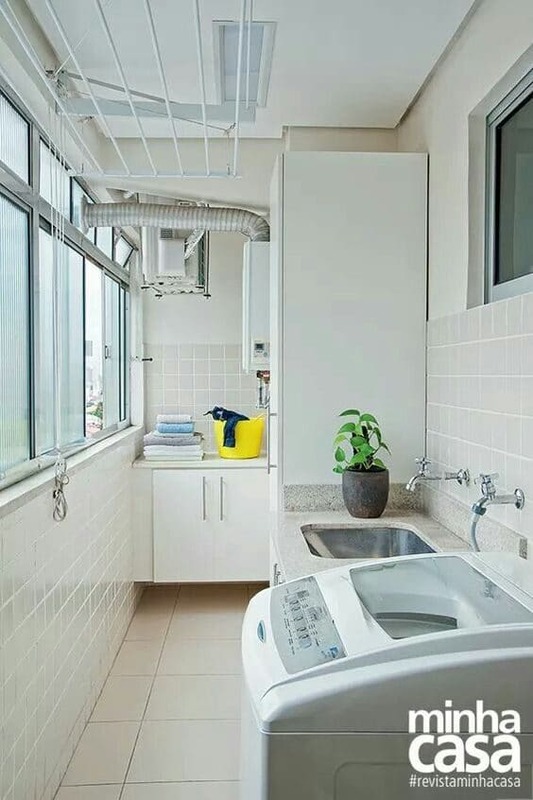 This is the most common area to put your washing machine. However, most people don’t think about renovating this area. 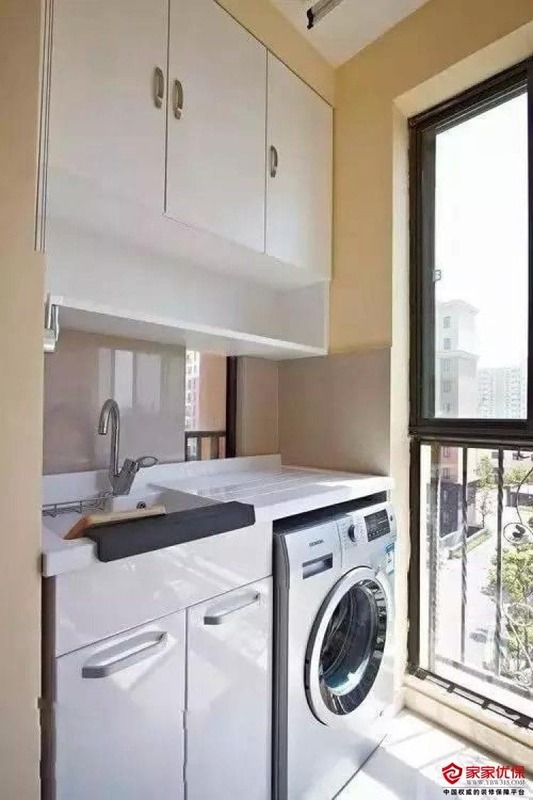 Instead, they will simply put the washing machine there, along with a foldable clothes drying rack, and that’s it. 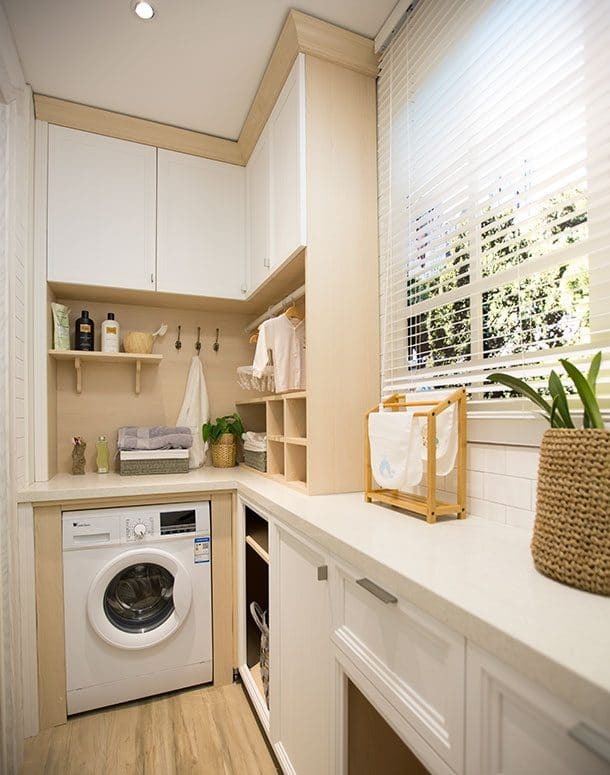 That’s a shame, because, if you put some effort into installing some built-in cabinets for your kitchen yard renovation, it can make your laundry area much more organised and tidy. It can even be stylish! 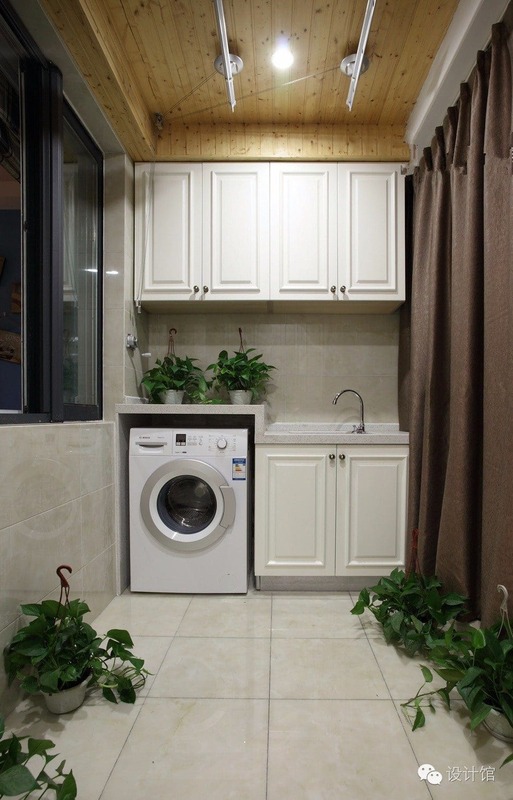 There are a few elements to consider when it comes to renovating your laundry area at the back of your house. If it’s enclosed, try to have large windows for sunlight. Make sure you have lots of cabinet space for storage, a countertop, space to put your washing machine and dryer, and a clothing rail for drying clothes indoors if it rains. 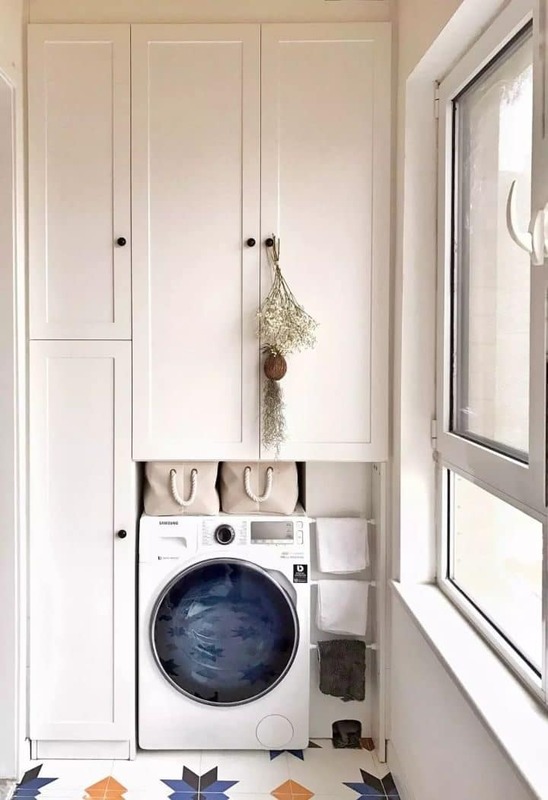 We have compiled up a few design ideas that you can take inspiration from and to start creating your own laundry yard! At Recommend.my, we have hundreds of contractors ready to serve you. 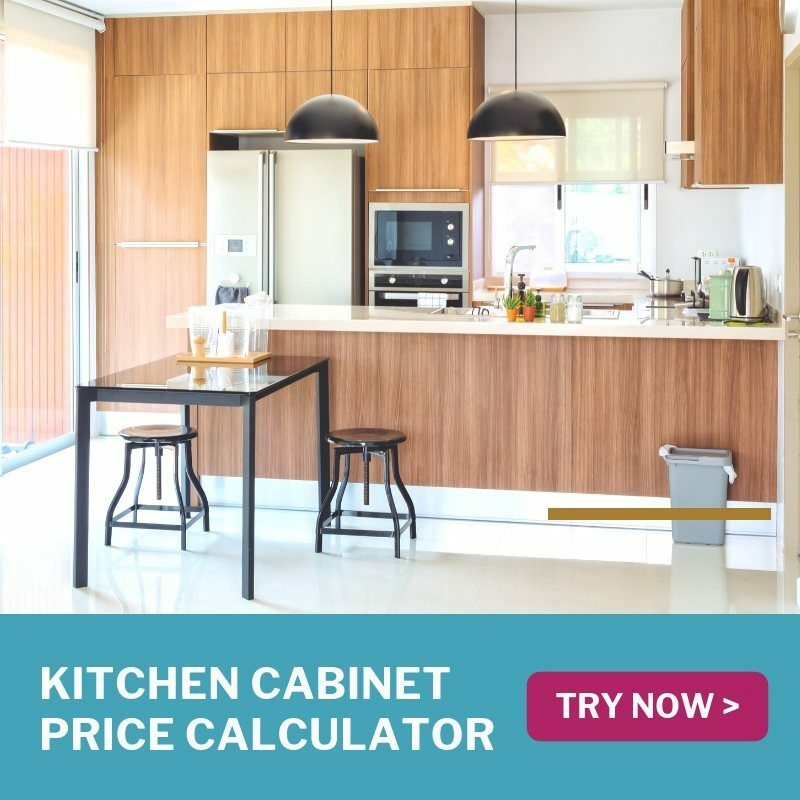 From installing built-in cabinets, to updating the floor tiles, to closing up the balcony, let us know your requirements and we will match you to suitable renovation contractors in Malaysia! 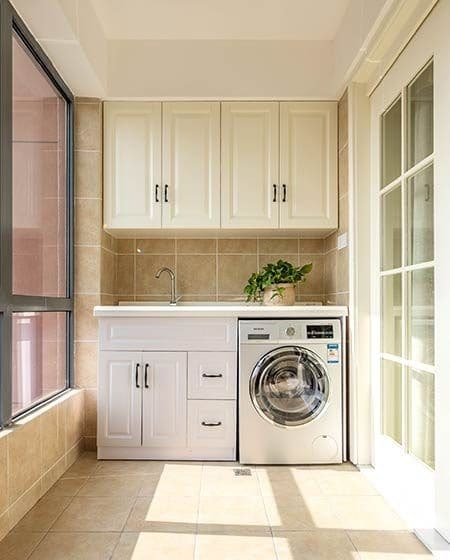 A well-organised laundry area creates a very smart and efficient space to your home, especially when the backyard area is very small. You can add wall storage cabinets to store detergent and other tools. Plus, add a useful countertop with a built-in sink for easy washing up. In the example above, the countertop is stepped down to make the height of the sink area more comfortable. If you have strong sunlight in your backyard, it can cause your cabinets to discolour over time. The owner above chose to use aluminium for the base cabinet, so it is unaffected by the sunlight. Putting your appliances on a raised platform will also make it easier to clean the floors. This Scandinavian inspired laundry design looks beautiful and minimal. The wooden laminate shelving is water resistant, and makes the space to appear brighter and much cleaner. Instead of cabinet doors, it uses open shelving, putting all the laundry cleaners and towels within easy reach. You can also add a backsplash to match with the countertop. It even has a folding door that completely hides the laundry area when not in use. Another classic yard design with a sink and cabinetry. The design also features a strong hanging rail fitted into the ceiling for drying clothes. Also, those large windows are perfect for letting the sun in to let your clothes dry quicker, but can be closed with roman blinds if needed. Here’s another example of a laundry backyard to makes use of every inch of width. Even if the window reaches down to the floor, it’s possible to add a countertop and cabinets. 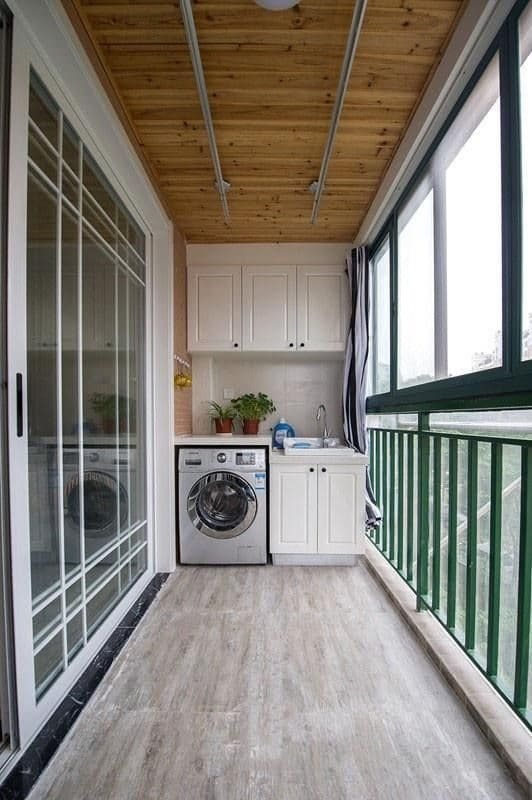 It also includes a ceiling-mounted clothes drying rail. The kitchen yard can get cluttered especially if your washing machines need to share the space with aircon compressors. To keep the space airy and bright, create an all-white yard with light floor tiles and white cabinets. 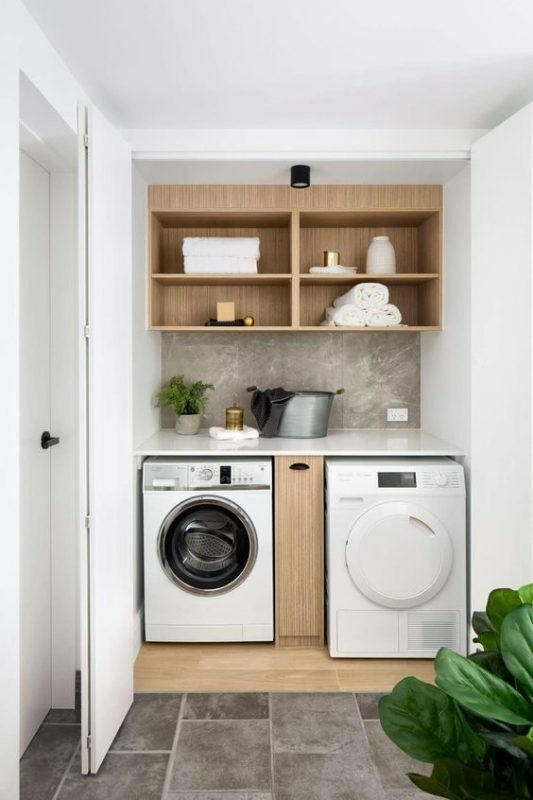 This all-white laundry yard cleverly mounts the dryer on the wall (you will need to buy a dryer model that can do this!). The checkerboard floor tiles and black countertop add visual interest. Instead of a sink and counter, why not fill an entire wall with cabinetry from top to bottom? This laundry yard looks so colourful and attractive with those patterned floor tiles. 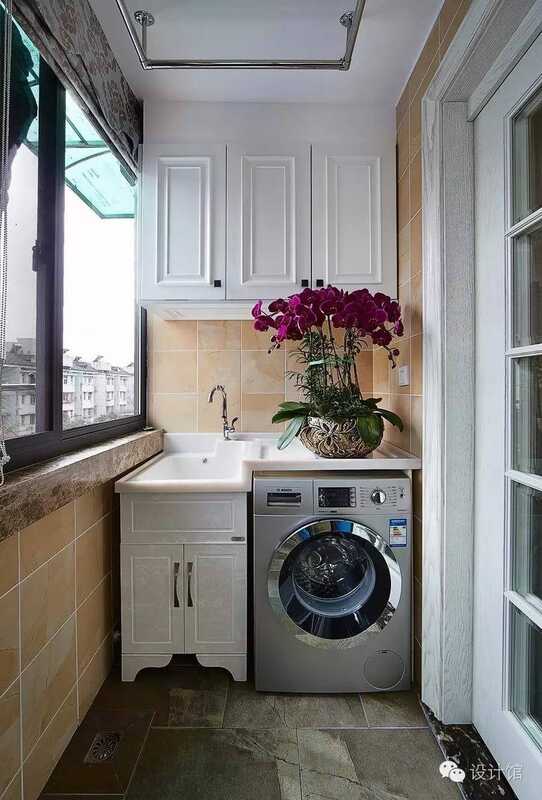 It has full height built-in cabinets along with railing on the wall for drying hand towels. With this cabinetry design, you will have plenty of space to store your laundry items. You can also create an L-shaped cabinet. 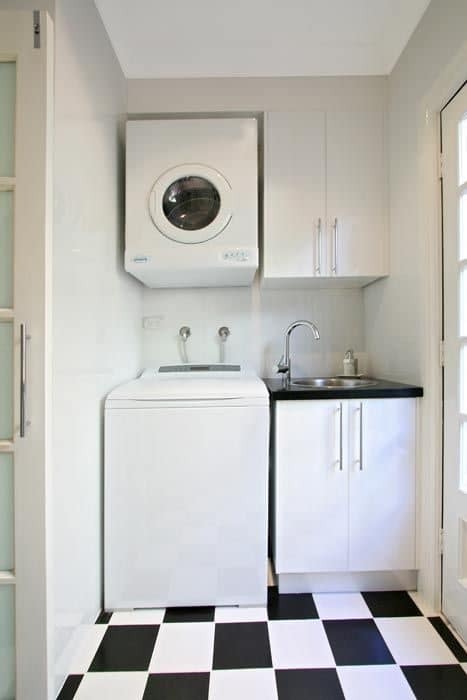 This laundry design will be great to maximise your existing space. There is so much countertop space here that you can even display your potted plants, hang your towels, or even grow herbs. This yard space was just made for built-in cabinets. It is recessed into the wall, so you can have full width cabinets without blocking the window. 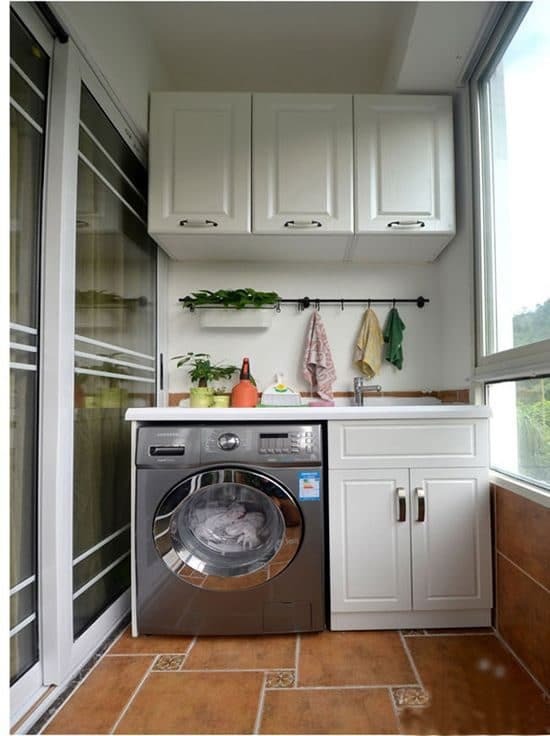 With cabinets and a sink, this makes the laundry space more compact and functional. Even when you don’t have a solid wall to mount your cabinets, you can create a functional laundry yard. Just tuck your washer inside a base cabinet to create a more functional space. 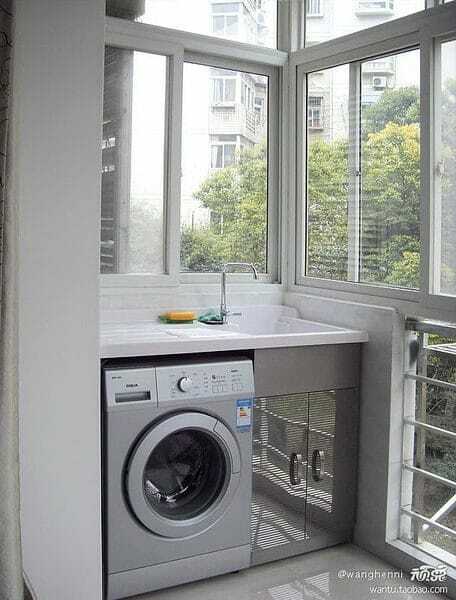 You can also have a sink countertop for hand washing delicate clothes. This yard also shows plenty of sunlight coming through those windows which will help dry clothes even quicker by the day. This laundry yard shows how we can get our laundry done using a yard space at home. 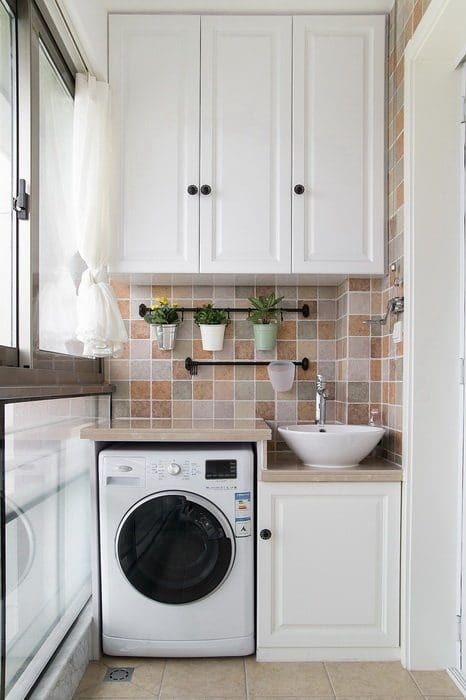 You can combine a laundry space with potted plants on those hanging rails, as it doesn’t take up much space. Those cabinets are also good for storage purposes. A laundry yard doesn’t have to use ceramic floor tiles. Laminate or vinyl flooring can be highly water-resistant, too. Use light colour tones to keep the space airy and bright. Born in 1997, a graduate from Mass Communication at KDU University College. Vanessa Ng is a Marketing Executive at Recommend.my. She writes blog articles about interior design and home improvement on Recommend Living, and also does campaign management. Her other passion includes in traveling, makeup and enjoying a cup of coffee.